Japanese naval aircraft prepare to take off from an aircraft carrier (reportedly Shokaku) for the Pearl Harbor attack during the morning of 7 December 1941. Plane in the foreground is a “Zero” Fighter. This is probably the launch of the second attack wave. The original photograph was captured on Attu in 1943. Official U.S. Navy Photograph, National Archives Collection. Caption: Naval History & Heritage Command. Japanese Navy Type 99 Carrier Bombers (“Val”) prepare to take off from an aircraft carrier during the morning of 7 December 1941. Ship in the background is the carrier Soryu. Official U.S. Navy Photograph, National Archives Collection. Caption: Naval History & Heritage Command. The Commanding Officer of the Japanese aircraft carrier Shokaku watches as planes take off for the Pearl Harbor attack, during the morning of 7 December 1941. The Kanji inscription at left is an exhortation to pilots to do their duty. Official U.S. Navy Photograph, National Archives Collection. Caption: Naval History and Heritage Command. A Japanese Navy Type 97 Carrier Attack Plane (“Kate”) takes off from a carrier as the second wave attack is launched. Ship’s crewmen are cheering “Banzai” This ship is either Zuikaku or Shokaku. Note light tripod mast at the rear of the carrier’s island, with Japanese naval ensign. Photo & Caption: Naval History & Heritage Command. Japanese Navy Type 99 Carrier Bomber (“Val”) in action during the attack. Official U.S. Navy Photograph, National Archives Collection. Caption: Naval History & Heritage Command. Japanese Type 00 Carrier Fighter (“Zero”) trailing smoke after it was hit by anti-aircraft fire during the attack. The masthead machinegun platform of a battleship is visible in the lower right. Official U.S. Navy Photograph, now in the collections of the National Archives. Caption: Naval History & Heritage Command. Halftone reproduction of a photograph taken from a Japanese plane during the torpedo attack on the ships moored on both sides of Ford Island. View looks about southeast, with Honolulu and Diamond Head in the right distance. Torpedoes have just struck USS West Virginia and USS Oklahoma on the far side of Ford Island. On the near side of the island, toward the left, USS Utah and USS Raleigh have already been torpedoed. Fires are burning at the seaplane base, at the right end of Ford Island. Across the channel from the seaplane base, smoke along 1010 Dock indicates that USS Helena has also been torpedoed. Japanese inscriptions at the bottom indicate that this view was published by Osaka University. Photo and Caption: Naval History & Heritage Command. Torpedo planes attack “Battleship Row” at about 0800 on 7 December, seen from a Japanese aircraft. Ships are, from lower left to right: Nevada (BB-36) with flag raised at stern; Arizona (BB-39) with Vestal (AR-4) outboard; Tennessee (BB-43) with West Virginia (BB-48) outboard; Maryland (BB-46) with Oklahoma (BB-37) outboard; Neosho (AO-23) and California (BB-44). West Virginia, Oklahoma and California have been torpedoed, as marked by ripples and spreading oil, and the first two are listing to port. Torpedo drop splashes and running tracks are visible at left and center. White smoke in the distance is from Hickam Field. Grey smoke in the center middle distance is from the torpedoed USS Helena (CL-50), at the Navy Yard’s 1010 dock. Japanese writing in lower right states that the image was reproduced by authorization of the Navy Ministry. Photo and caption: Naval Heritage & History Command. 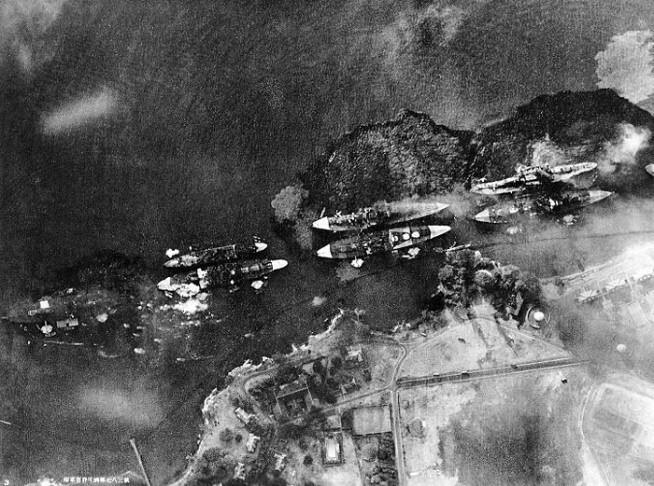 Vertical aerial view of “Battleship Row”, beside Ford Island, during the early part of the horizontal bombing attack on the ships moored there. Photographed from a Japanese aircraft. Ships seen are (from left to right): USS Nevada ; USS Arizona with USS Vestal moored outboard; USS Tennessee with USS West Virginia moored outboard; USS Maryland with USS Oklahoma moored outboard; and USS Neosho, only partially visible at the extreme right. A bomb has just hit Arizona near the stern, but she has not yet received the bomb that detonated her forward magazines. 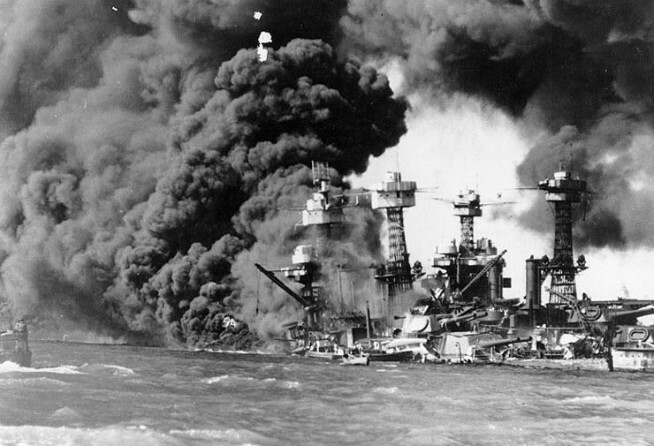 West Virginia and Oklahoma are gushing oil from their many torpedo hits and are listing to port. Oklahoma’s port deck edge is already under water. Nevada has also been torpedoed. Japanese inscription in lower left states that the photograph has been officially released by the Navy Ministry. Photo and caption: National History & Heritage Command. Vertical aerial view of “Battleship Row”, beside Ford Island, soon after USS Arizona was hit by bombs and her forward magazines exploded. Photographed from a Japanese aircraft. Ships seen are (from left to right): USS Nevada; USS Arizona (burning intensely) with USS Vestal moored outboard; USS Tennessee with USS West Virginia moored outboard; and USS Maryland with USS Oklahoma capsized alongside. Smoke from bomb hits on Vestal and West Virginia is also visible. 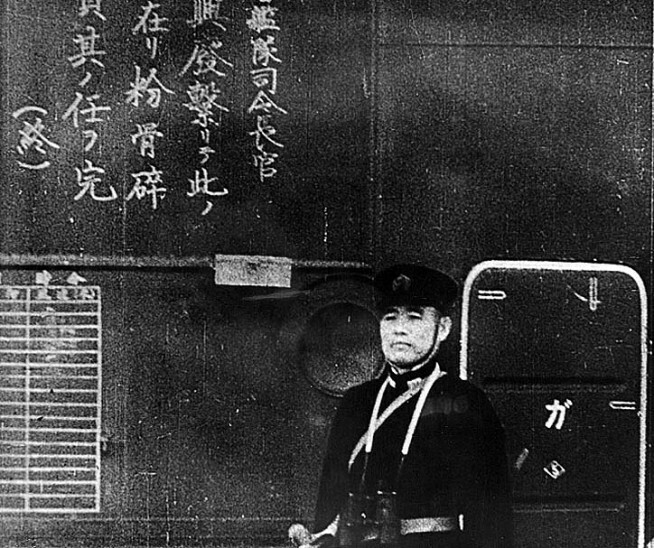 Japanese inscription in lower left states that the photograph has been reproduced under Navy Ministry authorization. Photo and caption: National History & Heritage Command. USS Arizona (BB-39) ablaze, immediately following the explosion of her forward magazines, 7 December 1941. Frame clipped from a color motion picture taken from on board USS Solace (AH-5). Official U.S. Navy Photograph, National Archives collection. Caption: Naval History & Heritage Command. USS Arizona (BB-39) sunk and burning furiously, 7 December 1941. Her forward magazines had exploded when she was hit by a Japanese bomb. At left, men on the stern of USS Tennessee (BB-43) are playing fire hoses on the water to force burning oil away from their ship Official U.S. Navy Photograph, National Archives collection. Caption: Naval History & Heritage Command. The forward superstructure and midships gun positions of the sunken USS Arizona (BB-39), afire after the Japanese raid, 7 December 1941. At right are the ship’s mainmast and boat cranes, which were beyond the areas wrecked by the explosion of her forward magazines. Official U.S. Navy Photograph, NHHC collection. Caption: Naval History & Heritage Command. USS Arizona (BB-39) sunk and burning, with the National Ensign still flying at her stern. Official U.S. Navy Photograph, National Archives collection. Caption: Naval History & Heritage Command. Crew abandoning the damaged USS California (BB-44) as burning oil drifts down on the ship, at about 1000 hrs on the morning of 7 December 1941, shortly after the end of the Japanese raid. The capsized hull of USS Oklahoma (BB-37) is visible at the right. Official U.S. Navy Photograph, NHHC Collection. Caption: Naval History & Heritage Command. The damaged USS Curtiss (AV-4), at left, and USS Medusa (AR-1), at right, at their moorings soon after the Japanese raid. Note that Curtiss has been fitted with an air search radar. Official U.S. Navy Photograph, National Archives. Caption: Naval History & Heritage Command. USS Maryland (BB-46) alongside the capsized USS Oklahoma (BB-37). USS West Virginia (BB-48) is burning in the background. Photo and caption: Naval History & Heritage Command. USS Nevada (BB-36) headed down channel past the Navy Yard’s 1010 Dock, under Japanese air attack during her sortie from “Battleship Row”. A camouflage Measure 5 false bow wave is faintly visible painted on the battleship’s forward hull. Photographed from Ford Island. Small ship in the lower right is USS Avocet (AVP-4). Note fuel tank “farm” in the left center distance, beyond the Submarine Base. Official U.S. Navy Photograph, NHHC Collection. Caption: Naval History & Heritage Command. USS Nevada (BB-36) afire and down at the bow, after she was bombed by Japanese planes while attempting to get to sea. Photographed from Ford Island. Note men in Nevada’s main top, manning .50 caliber machine guns. Official U.S. Navy Photograph, National Archives collection. Caption: Naval History & Heritage Command. USS Nevada (BB-36) beached and burning after being hit forward by Japanese bombs and torpedoes. Her pilothouse area is discolored by fires in that vicinity. The harbor tug Hoga (YT-146) is alongside Nevada’s port bow, helping to fight fires on the battleship’s forecastle. Note channel marker bouy against Nevada’s starboard side. Official U.S. Navy Photograph, National Archives Collection. Caption: Naval History & Heritage Command. 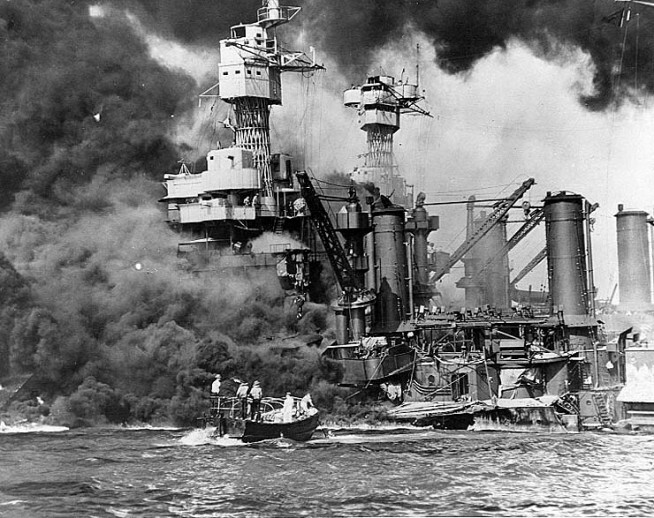 The USS OGLALA capsized after being attacked by Japanese aircraft and submarines in the attack on Pearl Harbor, 12/07/1941. Photo and caption: National Archives. Rescue teams at work on the capsized hull of USS Oklahoma (BB-37), seeking crew members trapped inside, 7 December 1941. The starboard bilge keel is visible at the top of the upturned hull. Officers’ Motor Boats from Oklahoma and USS Argonne (AG-31) are in the foreground. USS Maryland (BB-46) is in the background. Official U.S. Navy Photograph, National Archives Collection. Caption: Naval History & Heritage Command. USS Raleigh (CL-7) being kept afloat by a salvage barge moored to her port side, after she had been torpedoed and damaged by a bomb during the Japanese raid. Photo & Caption: Naval History & Heritage Command. Sailors stand amid wrecked planes at the Ford Island seaplane base, watching as USS Shaw (DD-373) explodes in the center background, 7 December 1941. USS Nevada (BB-36) is also visible in the middle background, with her bow headed toward the left. Planes present include PBY, OS2U and SOC types. Wrecked wing in the foreground is from a PBY. Official U.S. Navy Photograph, National Archives Collection. Caption: Naval History & Heritage Command. The forward magazine of USS Shaw (DD-373) explodes during the second Japanese attack wave. To the left of the explosion, Shaw’s stern is visible, at the end of floating drydock YFD-2. At right is the bow of USS Nevada (BB-36), with a tug alongside fighting fires. Photographed from Ford Island, with a dredging line in the foreground. Photo and caption: Naval History & Heritage Command. The twisted remains of the destroyer USS SHAW burning in floating drydock at Pearl Harbor after the “sneak Japanese attack” on Dec. 7, 1941. Photo and caption: National Archives. USS West Virginia (BB-48) afire forward, immediately after the Japanese air attack. USS Tennessee (BB-43) is on the sunken battleship’s opposite side. Photo and Caption: Naval History & Heritage Command. Sailors in a motor launch rescue a survivor from the water alongside the sunken USS West Virginia (BB-48) during or shortly after the Japanese Pearl Harbor attack. USS Tennessee (BB-43) is inboard of the sunken battleship. Note extensive distortion of West Virginia’s lower midships superstructure, caused by torpedoes that exploded below that location. Also note 5″/25 gun, still partially covered with canvas, boat crane swung outboard and empty boat cradles near the smokestacks, and base of radar antenna atop West Virginia’s foremast. Official U.S. Navy Photograph, National Archives Collection. Caption: Naval History & Heritage Command. Capsizing off Ford Island, during the Pearl Harbor attack, 7 December 1941, after being torpedoed by Japanese aircraft . Photographed from USS Tangier (AV-8), which was moored astern of Utah. Note colors half-raised over fantail, boats nearby, and sheds covering Utah’s after guns. Official U.S. Navy Photograph, National Archives Collection. Caption: Naval History & Heritage Command. Capsized hull of USS Utah (AG-16) off the western side of Ford Island on 12 December 1941, five days after she was sunk by Japanese aerial torpedoes during the Pearl Harbor Attack. View looks toward Ford Island, with Utah’s bow at left. USS Tangier (AV-8) is in the right background. Collection of Vice Admiral Homer N. Wallin. NHHC Photograph. Caption: Naval History & Heritage Command. USS Vestal (AR-4) after she was beached in Pearl Harbor on 7 December 1941. She had been damaged by Japanese bomb hits during the raid. An Officers’ Motor Boat is alongside her starboard quarter. Official U.S. Navy Photograph, NHHC Collection. Caption: Naval History & Heritage Command. Planes and hangars burning at Wheeler Army Air Field, Oahu, soon after it was attacked in the morning of 7 December 1941, as seen from a Japanese Navy plane. Photo & Caption: Naval History & Heritage Command. U.S. Army aircraft destroyed by Japanese raiders at Wheeler Air Field. Photographed later in the day on 7 December 1941, following the end of the attacks. Wreckage includes at least one P-40 and a twin-engine amphibian. Note the wrecked hangar in the background. Official U.S. Navy Photograph, National Archives collection. Caption: Naval History & Heritage Command. A U.S. Army B-17E at Hickam Air Field, after landing safely during the Japanese air raid. In the background is a B-17C (or B-17D). Smoke from burning ships from the Pearl Harbor attack is visible in the distance. The B-17E is probably that piloted by First Lieutenant Karl T. Barthelmess. Photographer may be Staff Sergeant Lee Embree. Photograph from Army Signal Corps Collection, National Archives. Caption: Naval History & Heritage Command. 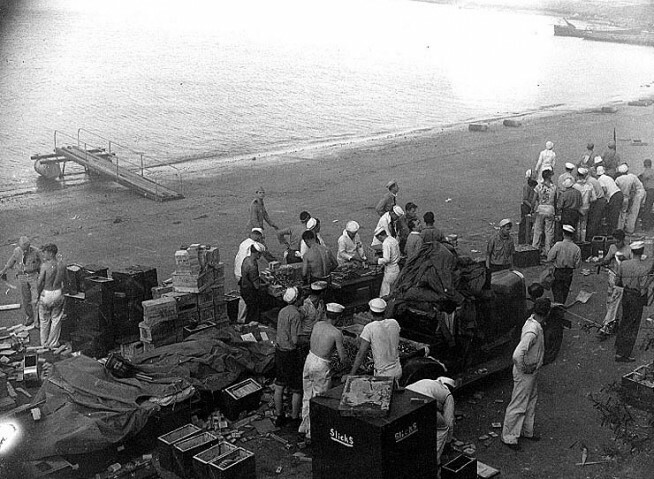 Sailors at Naval Air Station Ford Island reloading ammunition clips and belts, probably around the time of the attack’s second wave. Note what appears to be a seaplane boarding gangway at top left, and beached motor launches in upper right. Also note variety of uniforms worn by those present. Official U.S. Navy Photograph, National Archives Collection. Caption: Naval History & Heritage Command. PBY patrol bomber burning at Naval Air Station Kaneohe, Oahu, during the Japanese attack. Official U.S. Navy Photograph, National Archives Collection. Caption: Naval History & Heritage Command. Aircraft wreckage and a badly damaged hangar at Naval Air Station, Kaneohe Bay, Oahu, shortly after the Japanese air attack. Plane in the foreground is a PBY of Patrol Squadron 12, marked “12-P-3”. Photo and Caption: Naval History & Heritage Command. A beached two-man Japanese submarine found on the edge of Bellows Field, Hawaii, after the “sneak Jap attack” on Pearl Harbor of Dec. 7, 1941. Photo and caption: National Archives.